"I was an average student. No one said, 'He's going to achieve the American Dream.'" Mickey Drexler was recalling his prospects as a teenager and his time at The Bronx High School of Science, one of the country's best public high schools. It has produced numerous winners of both the Nobel and Pulitzer prizes. Drexler, 72, is the chief executive of J. Crew. As a teenager in the 1950s, he was accustomed to the freedom of city street life and didn't fully appreciate the opportunity his public school education afforded him until much later. Drexler didn't like the rigid structure and authority figures at school. Plus, being around kids who performed better than he did rattled a young Drexler's confidence. "If you're sitting next to Philip, every test he gets an A. It's demoralizing," said Drexler. But today, Drexler credits his high school education with helping him achieve the American Dream. "Bronx Science changed my life," said Drexler, who grew up in the South Bronx. "I started meeting kids who lived in Manhattan or in Riverdale or in Queens, and I started to see, 'Wow, there's really a whole different kind of a world outside of my own little neighborhood.'" The school was a gateway to college. No one from his mother's side of the family had ever attended. From there, Drexler went on to build a life that his parents, who struggled to carve out a meager existence for themselves, could never have imagined. In the process, he transformed the U.S. retail industry. 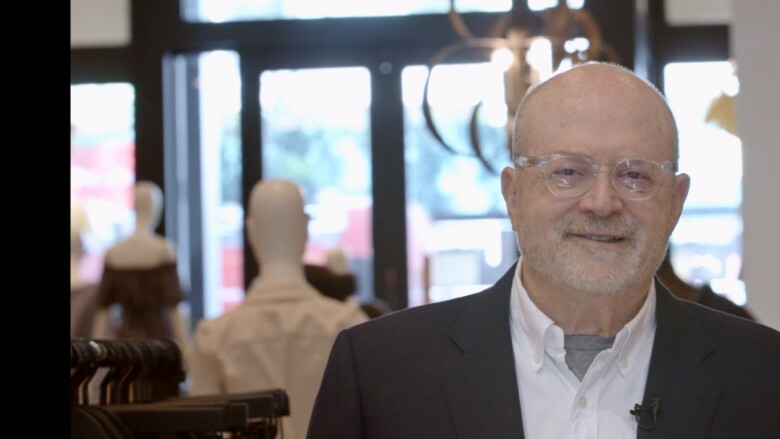 J.Crew CEO Mickey Drexler credits his high school education for helping him achieve the American Dream. Drexler is one of five influential leaders profiled in CNNMoney's The American Dream: New York. Their careers, talents and individual narratives are all different, but what unites them are a common origin and a passion for preserving the ability of future generations to rise like they did. In addition to Drexler, the project features Starbucks CEO Howard Schultz, former Xerox CEO Ursula Burns, hip-hop legend Russell Simmons and former Federal Research Chairman Alan Greenspan. Each overcame adversity to achieve success beyond their highest hopes. Drexler, who was interviewed before last year's election, didn't express strong opinions about politics. But he did comment on the campaign rhetoric. "The divisiveness is extraordinary between people and the parties. It's bringing out so much negativity," said Drexler. "We're immersed in it. I don't think that makes for a happy, optimistic world." Drexler grew up an only child in a Jewish section of the Bronx, and his mother died when he was 16. "All of a sudden, you don't have a mother," Drexler said. His childhood apartment on Allerton Avenue was so small that Drexler slept on a makeshift bed squeezed into the hallway entrance. He watched his father toil for years in the Garment District. At an early age, Drexler played stickball in the street with his friends, where he quickly learned to be self sufficient. He didn't expect much of himself. As a teenager, his only aspiration was to find a good job and prove to his father he could earn a decent living on his own. But Drexler's ambition intensified after college, when he started working in retail at Bloomingdale's at age 23. "I wanted to prove the world wrong," said Drexler. "I was in no means going to be satisfied, I think in hindsight, not to be very successful." Drexler's drive is palpable at J. Crew's headquarters in New York's Greenwich Village. His role these days resembles that of a school principal, which is ironic for a man who detested the hierarchy of his early education. J.Crew's employees hear Drexler's daily musings over a loudspeaker, in real time. Sometimes he will dial the company's public address system from the floor of one of the stores, where he scrutinizes the merchandizing and layout. For Drexler, interacting with customers is mission critical. He responds to every email personally, sometimes within an hour. Drexler attributes his work ethic to "shpilkes," which is a Yiddish word for "ants in your pants." Drexler's most explosive success came at Gap, where he started as president in 1983 and was promoted to CEO in 1995. He turned the retailer into a powerhouse brand that changed the way America dressed. Drexler's reign at Gap ended in 2002, when he was fired by the company's founder after 12 consecutive quarters of same store sales declines. The dismissal was tough on Drexler. "I spent 18 years there building a company. I was hurt [by] the way it happened," said Drexler. But like the other leaders profiled in The American Dream: New York series, Drexler refused to let the setback define him. "You just keep moving forward," Drexler said. "You cannot stop. I don't know what others might say about it, but I find [that failure] is a reasonably common condition among people, it's how people build companies." That philosophy continues to guide him today as he leads J.Crew through a turbulent time in retail. Despite all his previous accomplishments, Drexler feels the weight of his role. "You want to prove yourself more. You have responsibility for an organization. I feel today as close to it as I've ever felt. Am I 100% there?" asks Drexler. "That's part of being successful...getting up every day with something to learn, something to do and having responsibility."